(August 4, 2016 – Toronto, ON) The Festival del film Locarno can trace its beginnings back 69 years. Over the past many years Canadian films have found a home at this international festival. Located in the heart of Europe in the Swiss-Italian town of Locarno, the festival has been described as the “world capital of auteur cinema.” Thousands of film fans and industry professionals meet here every August for 11 days to share their thirst for new discoveries and a passion for cinema in all its diversity. There are two Canadian films at this year’s festival, which kicked off yesterday. Colombian/Canadian filmmaker (and TIFF manager of communications) Lina Rodriguez brings her third production and second feature to Locarno. Mañana a Esta Hora (This Time Tomorrow), pictured above, is set in Bogotá, Colombia and is an intimate portrait of a family’s everyday life before and after a tragic incident that forces them to confront an uncertain future. The film is produced by Rodriguez’s production company, Rayon Vert, which she runs with Brad Deane. Mañana a esta hora (This Time Tomorrow) costars Laura Osma as Adelaida, Maruia Sheldon as Lena and Francisco Zaldua as Francisco. The cast also includes Valentina Gómez, Clara Monroy who appeared in Rodriguez’ first feature, Señoritas, Francisco Restrepo, Juan Miguel Santana (Señoritas), Catalina Cabra, Juan Pablo Cruz and Alejandra Adarve. The story focuses on the bright and beautiful, 17-year-old Adelaida (Laura Osma) who lives with her parents Lena (Maruia Shelton),an event planner, and Francisco (Francisco Zaldua), a sculptor and art teacher. Together, the trio enjoy a comfortable family life in an apartment in Bogotá. However, cracks begin to show through the veneer of this picture perfect family. Given that Francisco isn’t as involved in the domestic details at home, most of the housekeeping and parenting duties fall onto the already overworked Lena. At the peak of her teen angst and facing her own identity crisis, Adelaida is constantly at odds with her mother: one minute she is sweet, caring, studious;the next, wildly tempestuous and defiant, staying out late to spend time with friends and flirt with boys. Until tragedy strikes…and the family is forced to confront their biggest struggle yet. Desperate to hold on to the ties that bind them together, they must face the uncertainty that tomorrow brings. The second Canadian film at Locarno is the short Animals Under Anaesthesia: Speculations on the Dreamlife of Beasts from directors Melanie Shatzky and Brian M. Cassidy. Their 2012 feature Francine premiered at the Berlin International Film Festival, and their 2011 documentary The Patron Saints, won the best new talent award at the Montreal International Documentary Festival. 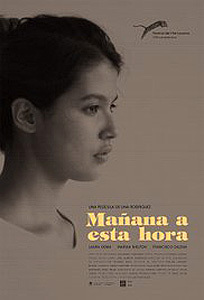 Mañana a Esta Hora (This Time Tomorrow) screens tomorrow, August 5, and the festival continues until August 13.